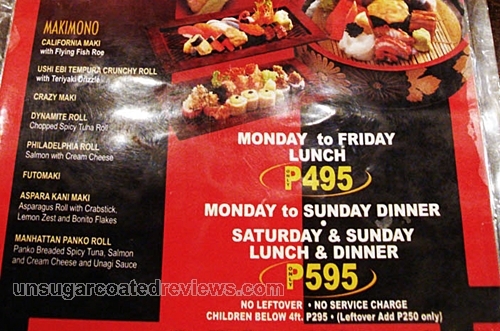 We availed Matsuri's Ensogo promo -- an eat-all-you-can dinner. Matsuri's buffet is different from traditional eat-all-you-can promos in that the diners don't have to get food from a buffet table. Instead, you order what you want and the food is served to your table. I'm a sucker for salmon sashimi so bf and I ended up wolfing down five plates of their Spicy Shake Sashimi. We loved it. The other food we ordered were good as well. I got no complaints regarding the taste. The order-all-you-can promo for P295/head was definitely a good deal. Even their regular rates are okay. I don't remember for sure, but the interiors looked the same as that of Jozu. Not surprising, since both restaurants have the same owner. Nevertheless, the interiors were classy and well-lit. There were a lot of customers (the promo was a hit, as you can see from the first picture) but it was not hard to converse with your companion and you still feel a sense of privacy. Calling for reservations was a breeze. The girls who greeted us and ushered us to our table were nice and warm. The male server attending to us was accommodating and attentive. Food was served quickly. So far, so good. However, by the end of our meal, the servers were behaving oddly. I was about to take the last slice of sashimi left when a female server appeared then took away our plates. I think there was a time limit for ordering, which was fine with us, but it was rude for her to just take away the food without even bothering to ask if we were done eating. They were probably going to throw it away anyway. To be honest, we got suspicious if it was a trap -- if they were going to use that sashimi slice to claim that we had leftovers and so had to pay the P250 penalty. The male server came to our table and we mentioned the incident while ordering our ice cream. When he came back, he informed us that they had run out of ice cream and then served us pineapple and watermelon slices instead. By then, he looked annoyed. We didn't know why. Did he get in an argument with someone in the kitchen? Did he think that we were taking longer than usual to finish? Was he annoyed because we ate a lot of sashimi even though we paid only half price? Feeling that we've overstayed our welcome, we just paid the bill then left. 233 Tomas Morato cor. E. Lopez Jr.
Great place for sushi monsters out there. happened to me too! 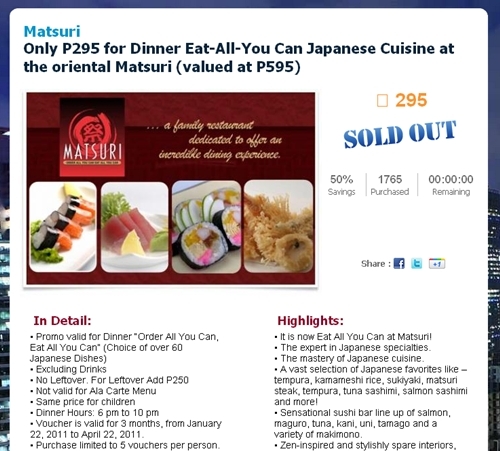 bad experience at Matsuri morato on a mother's day!